Back in the 1970’s I spent some time exploring black and white infrared photography. Infrared film was tricky stuff back then: photographing a mostly invisible spectrum of light, you never knew what you were going to get until you developed the film. There were just a few rules of thumb in planning shots, such as vegetation would tend to be white and water would tend to be black. On top of that, the film came in 36 exposure rolls and you had to load the film into the camera in total darkness. You had to really make each shot count. When I started to get back into “artistic” photography a couple years ago, I learned it was possible to have a digital camera tweaked to record infrared light exclusively. I proceeded to get a used Nikon D50 and shipped it off to Life Pixel for conversion. When I got the camera back, I was amazed to find how much easier digital infrared photography was. Now I can immediately see what I’m getting, and I can take hundreds of shots at a time if I want. The images also appear to have a much broader exposure range than what I remember from infrared film in the 1970s. Some of my infrared photographs can be found below. Clicking on an image will open a larger version. 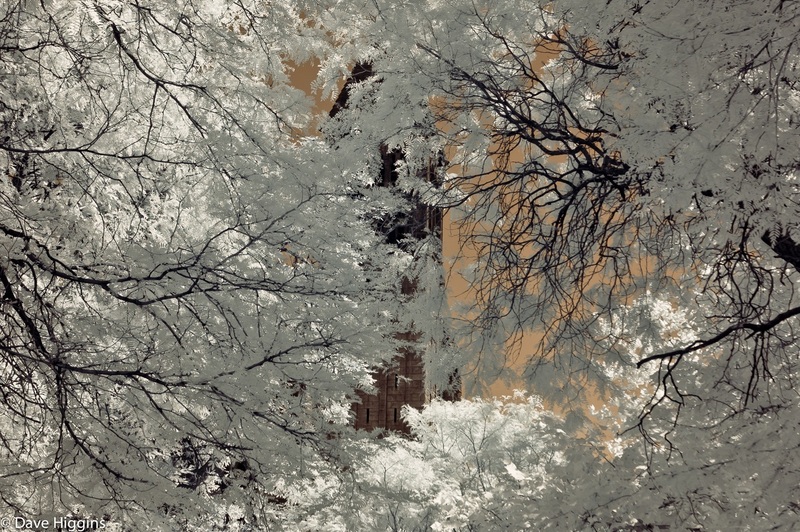 this…..photo.locust trees and city hall/albany….most beautiful of aLL.ever seen.